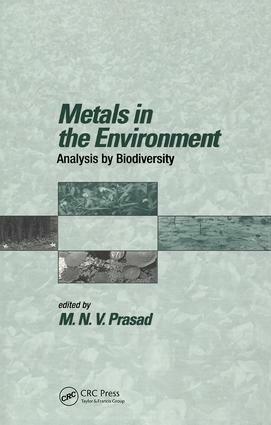 A summary of data on heavy metal accumulation, biomonitoring, toxicity and tolerance, metal contamination and pollution in the environment, and the importance of biodiversity for environmental monitoring and cleanup of metal-contaminated and polluted ecosystems. It advocates the use of bacteria, mycorrhizae, freshwater algae, salt marshes, bryo- and pteridophytes, angiosperms, constructed wetlands, reed beds, and floating plant systems and tree crops to treat wastewaters and industrial effluents containing toxic heavy metals. Bacteria; mycorrhizal fungi; freshwater algae; saltmarsh metallophytes; lichens; bryophytes and pteridophytes; angiosperms (asteraceae, poaceae, caryophyllaceae); angiosperms (brassicaceae); aquatic macrophytes; plant response to aluminium toxicity in acid soil; tree crops; tree bark; tree rings and dendroanalysis; heavy metal interactions in soils and implications to soil microbial biodiversity; behaviour of heavy metals in soils.